It was 10 a.m. and already too hot. Dust and the sound of uncorked V-Twins filled the air, and every decibel of spent combustion beat inside my head like a John Bonham drum solo. Surrounded by Harley-Davidsons covered from the grime of 1500 miles, trailers, and the empty Jack Daniels bottles of last night’s shenanigans, it finally hit me: this is what Sturgis is all about. Sturgis is a knock-down, drag out, low-down, and dirty good time. It’s as trashy, rock-and-roll, and loud as all the stereotypes suggest, but stereotypes don't matter when you’re having one helluva good time, and the experience is only heightened when you road trip out here. 4 days, 1500 miles, megatons of gasoline, and GoPro cameras recording every second; this is how you road trip on Harley-Davidsons. Touching down in Seattle was the official start of the trip to Sturgis. Our trip began in earnest early the next morning. The fleet of new Harley-Davidsons sat in the morning fog waiting to fire up and wake up every single person that was still sleeping. Every bike was represented, from Sportsters and Softails and everything in between. 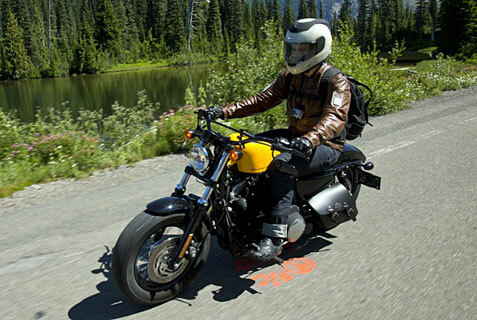 I chose the Harley-Davidson Forty-Eight for the first day of riding – a 1200cc Sportster slathered in yellow and black like a pissed-off wasp. Clad with chunky tires and a bobbed rear fender, it sat like a bulldog in the early morning sunlight. The goal for the day: cover 815 miles and arrive in Lewiston, ID. All that stood between us was miles of twisting highway and Mt. Rainer National Park. Quickly, I learned that this was going to be no doddering ride. Riding with some of the best extreme athletes in the world – people who see broken bones as a minor inconvenience – the pace would be swift regardless of the road ahead. And what lay ahead? Only miles of forest, mountain vistas, drop-offs that were comically high, and gravel in construction zones located right near those drop-offs. Every corner was a new, breathtaking view. After awhile, the sensory overload causes you to not be impressed. Oh, another mountain seemingly punching the clouds. Oh, how nice, another raging river crossing through picturesque forest landscape. And as gorgeous as it was, Mt. Rainer Park was soon behind us, the Forty-Eight taking every corner much better than I thought it could, and happily thumping along hundreds of miles. The first day would end as we crossed into Lewiston, ID. The road in was also picturesque and gorgeous. Slowly rolling hills, the sun setting on our backs, and throttling the Harley’s through, it was a day of excellent riding. Not perfect, though, as a glaring flaw of the Forty-eight would shine through: suspension travel. On the rear, you pay for that low and lean look by sacrificing damping and travel in the suspension, and your back takes the lumps for it. It wasn’t nearly enough to dampen the spirits of the day though. Another day, another early morning rise, and miles of asphalt ahead of us. This time, though, I chose the Harley-Davidson Night Rod as my ride for the day. You may remember the Night Rod from our previous story when Bullz-Eye rode it at Indianapolis Motor Speedway, and its sibling the V-Rod Muscle on a trip in Miami. For those who don’t, the Night Rod is Harley-Davidson’s cruise missile. It’s the most powerful Harley-Davidson available, and our example was, as you can probably guess from the name, black as night. Smooth and powerful, it eats highway and miles effortlessly without any fuss. Another national park, more highway miles, and more of the absolutely most healthy road food in the world, and the day flew right by. 800 miles in, our trip to Sturgis was at the halfway point. Day Three for me and the motley band of athletes would cover the least amount of miles, but lead us through Yellowstone to do it. The good was the fact that Yellowstone National Park is a mile of untamed wilderness, geysers,and bears. Mostly bears. Miles and miles of bears. It is also full of tourists, so the group’s hope to cruise right through was quickly dashed when we were stuck behind lines of tourists looking at “wilderness.” Yes, you should stop and smell the roses and take pictures of elk for your Facebook feed, but not every time. Then, bison decided they didn’t want us to pass either. Bison, if you are not aware, do not give two shits about anything. Ambivalent to passing cars, RV’s and motorcycles. They will squat anywhere, at anytime, and sit there. At one point, the bison decided that the front of our group was a great place to take a break. Bison are also huge, and aggressive if you pass them, so with this in mind, we waited until they decided to move. Noticing that we were heating up as the bikes idled beneath our legs, the bison moved only slightly to let us pass. How polite of them. The capstone of the day more than made up for the slog through Yellowstone with a pass through Beartooth Hwy. I didn’t see any real bears in Yellowstone, but this highway sufficed. A true “bucket list road,” it's a highway on top of a mountain crossing between two states with intimidating switchbacks, barely any runoff, and the terrain that constantly taunts the limits of your courage. For this pass, I was back on the Forty-Eight, and completely content even though I was not on the latest sportbike. The Forty-Eight exemplifies fun over fast. And on a road like this, fast will send you toppling over a mountain, while fun will bring a smile to your face. Next stop: Sturgis. Our last day on the road was a hammer down day. Miles and miles of straight highway to get through, and only one way to get through it: full throttle. Going down the highway like this is a lot like time travel. You’re not doing much, but going through space. On a bike meant for touring, the ride is boring, but comfy. But I was not on a touring bike. For this day, I was on a Harley-Davidson 72. Part of the Sportster family like the Forty-Eight, the 72 trades yellow paint for a metallic-flake crimson, and black for Chrome. Additionally, it has mini-ape hanger handlebars, whitewall tires and super skinny front tire. It’s a chromed-out, badass bike for cruising around town, but this isn’t puttering around town, it’s going a “respectable” clip down the highway. But, discomfort aside, we made it to Sturgis. What a difference a change of scenery makes for the 72. Uncomfortable on the highway, you become a star on the boardwalk. Waltzing in to a sea of black, the flaked, chromed 72 is a middle finger to seriousness. And Sturgis is serious business. As you approach the town, the density of bikes increases until you’re swimming in schools of much too loud Harley-Davidsons. We have arrived at the ultimate bike rally. But we wouldn’t be staying in Sturgis itself, but rather camping slightly past the city at the Buffalo Chip. Dusty and full of noise, the Buffalo Chip is like Woodstock; just replace the hippies with Harleys. 15 minutes into the camp ground and I hadn’t seen one pair of sleeves and overheard conversations that would make Rush Limbaugh blush. It’s a non-stop party sprinkled with all the trappings of a country music concert, fused with a NASCAR race, and then spread over miles and miles of American soil. For as much as attendees put on the air of rebellion, there’s serious money there. Don’t worry – there are plenty of people who you’ve probably seen on “Cops,” but many there are attending with huge trailers, decked out trucks and multiple bikes. And everybody is here to party. Ziplining, guns, beer, and plenty of music (Journey, Boston and Eric Church all played while we were there), it’s a Blue Collar Comedy Tour theme park. Embrace it, and you’ll have the time of your life and a pounding hangover. Sturgis is both a hopelessly nostalgic trip down memory lane for the boomers that attend, but also a rollicking good time for a younger generation. It’s the tradition of the road trip passed down to a younger generation – the urge to just pack up and ride to the biggest two-wheeled party on earth, but with a modern twist. With Go-Pro cameras, iPhones and a Wi-Fi connection, road trips are much more fun when you can share them with those that don’t attend.